We look forward to spoiling you at "Residence on Robe"! 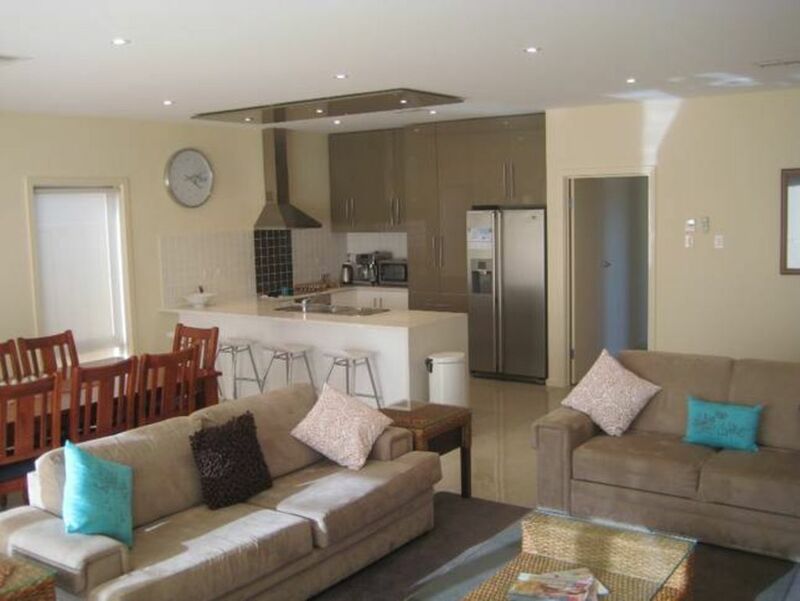 A Residence on Robe is a spacious and modern 3 bedroom house located only a few minutes from Robe's main street and town beach. Luxuriously appointed with modern fittings and furnishings guests enjoy a 46 inch LCD TV, Wifi and Netflix , fully automatic coffee machine, seating and dining for up to 10 people as well as a full size second drinks fridge and freezer. Relax with a BBQ in the paved courtyard (complete with retractable blinds for sun and wind protection) and after a day on the beach the children enjoy the selection of DVDs and games provided. Please note that during peak visitation times (summer school holidays, Easter etc) the pricing is based on exclusive occupancy which can be anything from one to 8 people. At all other times the tariff is based on a double rate with an additional charge for each additional adult and child. King Size master bedroom with ensuite bathroom. The master bedroom also has a large walk in robe. The second bedroom also has a king size bed with the bathroom adjacent.The bunk room or "kid's retreat" is Ideal for 2 adults or 4 children in multiple configurations. Bunk has innerspring futon Sofa on bottom level that converts to a double bed. Single bed on top level of bunk. King Single Bed has a pullout trundle . In the bunk room there is also a wall mounted TV/DVD. A Portacot and highchair are also available should this be required for infants. Guests can cook up a storm in the chefs kitchen complete with stainless steel appliances, dishwasher, an ice making fridge and espresso coffee machine. After a day at the beach or exploring sink into the comfy couches and take in some Austar or a DVD on the 42" TV. There is elegant dining for up to 10 both in the living area and the covered rear courtyard. The BBQ and sun lounges are also popular with guests and the outdoor roll down blinds in the courtyard offer additional protection from the sun and wind. 130m to a cooked breakfast at many cafes! 150m to the Bottle Shop. 700m to the Beach, Lake, Hotel/Restuarant. Min. stay - 2 nights, Long weekend min. stay - 3 nights. Peak Season - 20th Dec to 31st Jan - 7 night min booking. All prices include Bed Linen & Bath Towels. I (Catriona) grew up on a farm just out of Robe. My family are still on the property and have the Governor Robe Wine label and cellar door in Robe's main street. The Cellar Door and attic house are managed by my cousin Dimity and her daughter Katie. After getting married to James in 1991 in Robe , James and I moved to Mansfield Victoria. I set up 6 holiday cottages called Alpine Country Cottages. We still operate 2 of the Studios in Mansfield- Studio 7 and Studio 3 so if you are keen for a skiing holiday google Studio 7 and Studio 3. We stayed at a Residence on Robe on a number of occasions and when it came on the market it was the perfect place to expand upon our holiday accommodation. Robe resident Marilyn Perkins manages the property and keeps it extremely clean. James and I still live in Mansfield with our 2 children , Liam 21 who is a professional dancer and Hayley, 17, who is a professional skateboarder. As we had stayed at Residence a number of times and loved it so much we thought it would be perfect! Residence sleeps large groups (up to 8 people). It is walking distance from the main street, town beach, coffee shops and sky seafoods. Huge living room with lounge and huge smart TV and seating for up to ten people. A chefs kitchen with ice making fridge, espresso machine, full size stove and oven, breakfast bar and additional items such as a slow cooker and electric fry pan. A large range of DVDs for children and adults. A covered private courtyard with retractable blinds for sun and wind protection. Comfortable clean up market accommodation with every facility. Close to town, beaches and restaurants just park the car and leave it. We thoroughly enjoyed our stay, fantastic house and facilities, great location. The owners were very easy to deal with and provided great tips on eating and location etc. Would highly recommend it and hope to return. Very clean, accomodating owners, right between two great cafes! Loved it! One of the best properties we've ever stayed at. Everything was thought of, even a yoga mat in the bedroom cupboard and every utensil you could possibly want in the kitchen. Would definitely recommend this property to others. People renting out their properties could take lessons from the owners of Residence at Robe. The house was clean, with quality linen and furniture and everything you could need. The owner was very thoughtful and helpful.